What a wonderful breakfast and easy, too. How can you beat that? This wonderful breakfast was in honor of our newest house guest and resident illegal alien, Hetty the Hen. Let me introduce you to Hetty the Hen. This breakfast is in honor of Hetty because she comes with quite a story that is well worth sharing. We hope it brings a smile to your face. You see, I was diligently working one day when I received a shipment from Dublin, Ireland. My secretary very quizzically inquired if I knew anyone from or had any dealings with anybody with the IRA. I told her my investments were fine. Little did I expect what was held within this curious red paper wrapped package. Accompanying this mysterious package was the following letter, which, being cautious with the mysterious package, was read first before opening. Lo and behold, I was startled by the revelation it held within. Now, in 1999, Texas became the first state to pass a Baby Safe Haven law. Under the safe haven law, someone who has a child under 60 days old that they do not want can take the child to an EMS provider and drop the child off, no questions asked. The EMS will notify the Department of Protective and Regulatory Services who will immediately take possession of the child and place the child for adoption. Nothing about the safe haven law deals with Irish hens or law offices! Imagine my surprise to find a forlorn, lonely hen seeking adoption in the US. Also, having only recently becoming empty nesters, I was startled to see I would now be responsible for another being, replete with immigration issues no less! Nevertheless, after calming down from the initial shock and everyone dropping by to see what was the hysterical commotion in my office, being the gullible soul that I am and knowing Baby Lady would love to have a hen in the kitchen, I took Hetty home with me where she currently resides. Baby Lady adores Hetty and treats her as one of her own. Her naturalization is going forward although I am having some difficulty obtaining a temporary work visa because holding eggs atop a refrigerator for some reason doesn’t qualify as a job classification. Go figure. As such, we are in intense negotiations with the Office of Customs and the Department of Immigration and Naturalization Services to assure Hetty’s continued legal status in DFW. It may ruin any political aspirations I may have but we will never relinquish Hetty for deportation back to Dublin. I have been assured not to worry, however, because Hetty take up so little space, is beloved by all and may be entitled to political asylum. In the meantime, Hetty has made herself quite at home and rules the roost with several nice roosters who have been wanting a little female companionship. 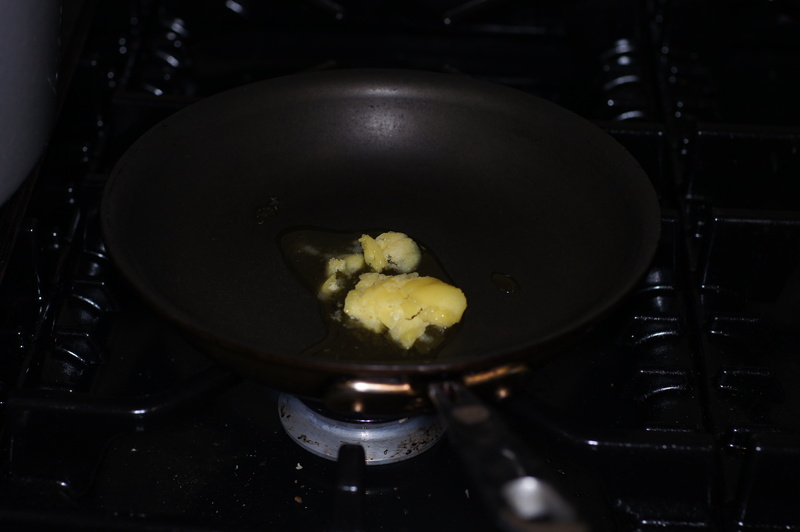 Using an 8 inch egg pan, add the clarified butter to the pan over medium-high heat. 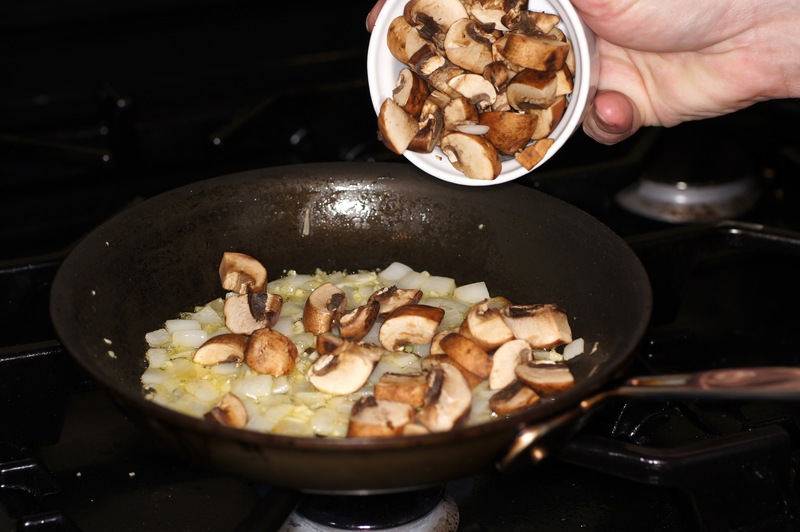 Cook over medium-high heat until the mushrooms have browned, released their liquid and have reduced in volume by 1/2, roughly 2 – 3 minutes. Now add the chicken. 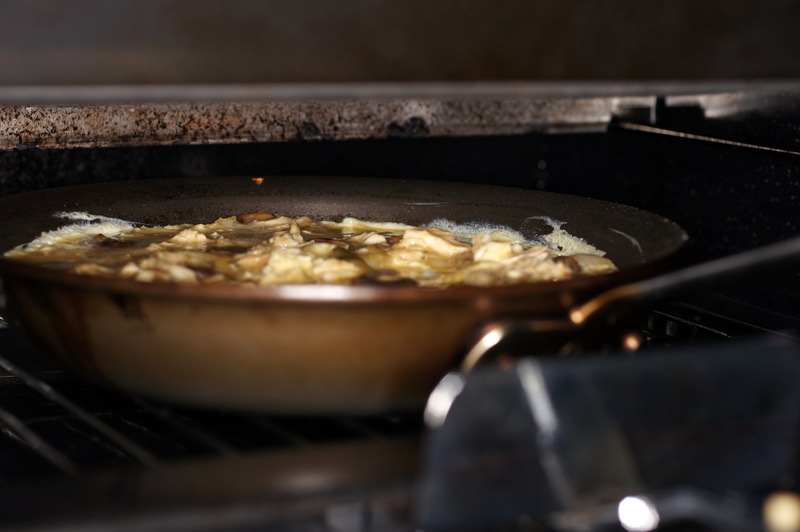 Allow eggs to cook undisturbed for 60 seconds. 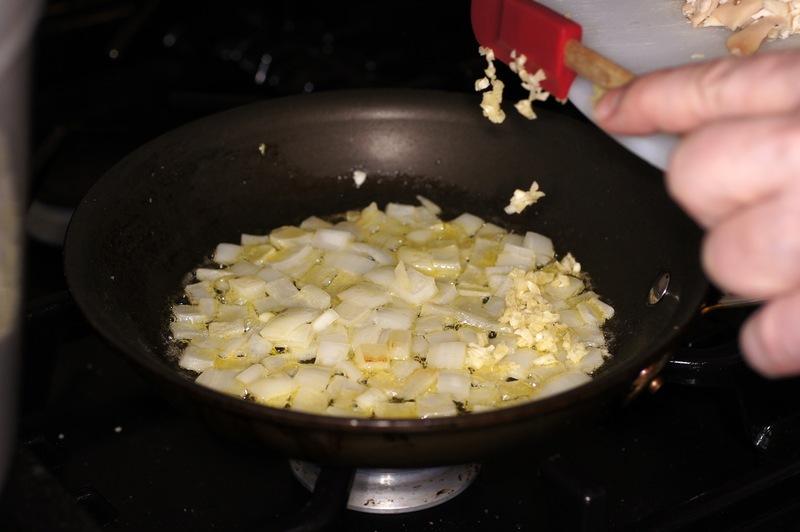 Then, stir the bottom of the eggs breaking up the curds that have formed. 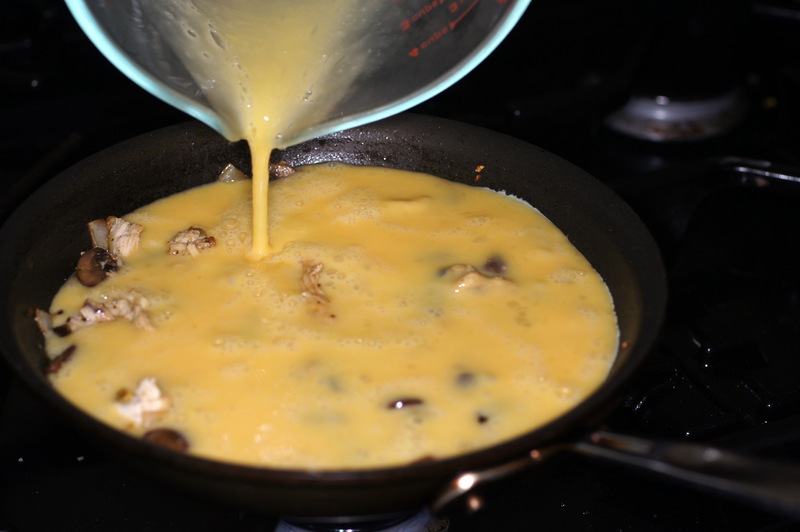 Stirring the eggs and breaking up the curds forms bulk and helps the frittata rise in the next step. 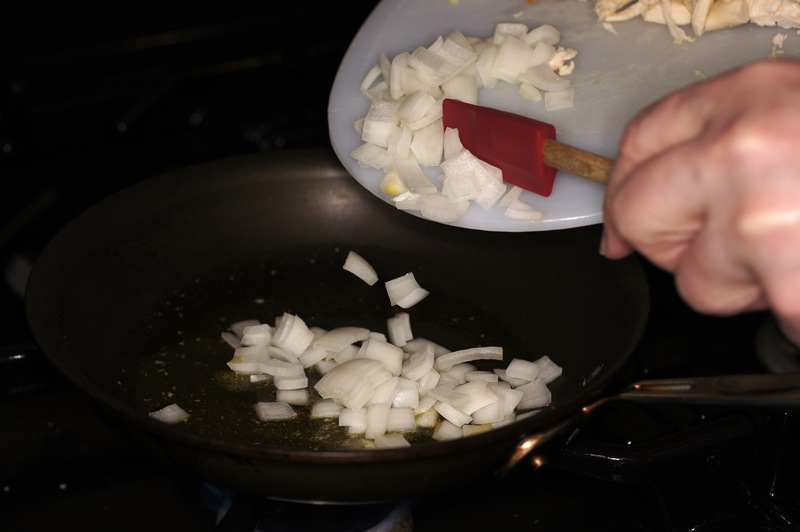 Now continue to cook over high heat another 30 – 60 seconds. 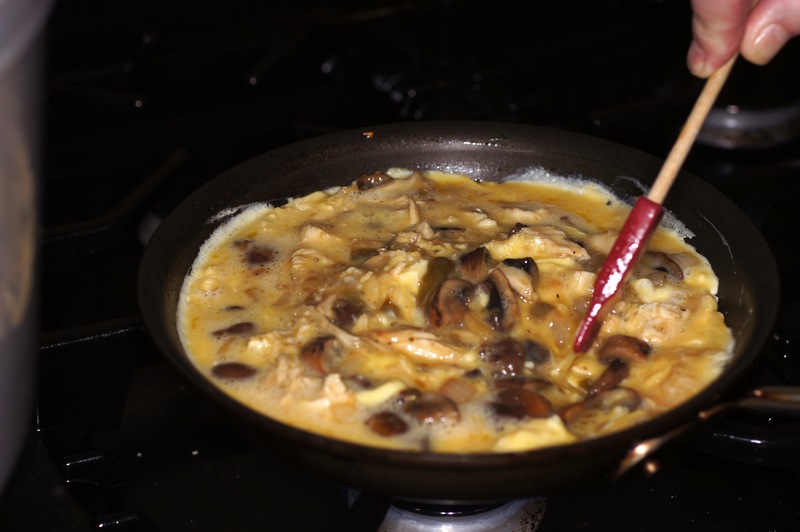 Remove from heat and place under a broiler. Having cooked the eggs on the bottom and developed bulk it’s time to cook the eggs from the top. This enables the eggs to now rise and form an airy, eggy treat. Look how much the eggs rise under the broiler. 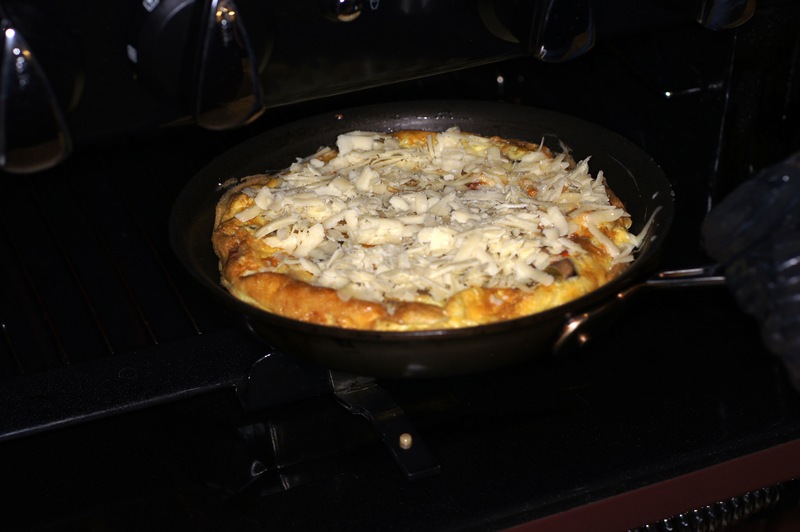 At this point, roughly 2 minutes under the broiler, remove the frittata and top with white cheddar cheese. Return to broiler to melt cheese. 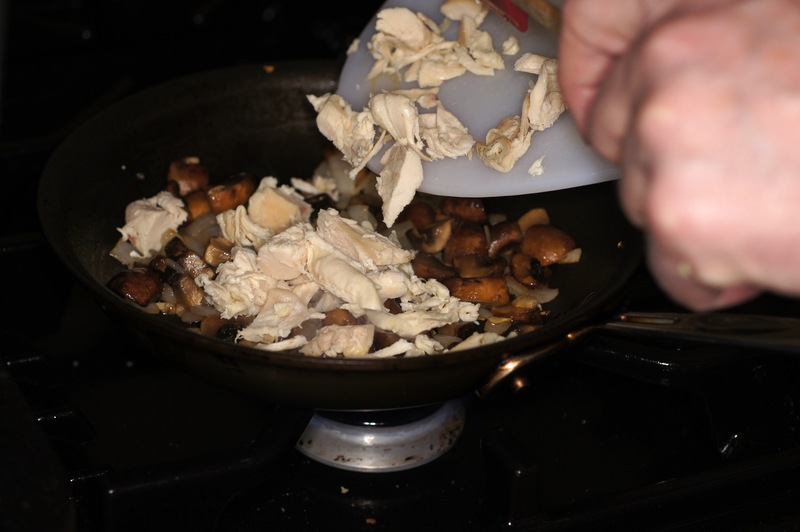 Remove from broiler, place on a cutting board. Cut into quarters, serve & enjoy. This is a perfect breakfast for 2. Thanks, Trine-Marie. It’s very tasty and easy to make. You can also use whatever ingredients you like. 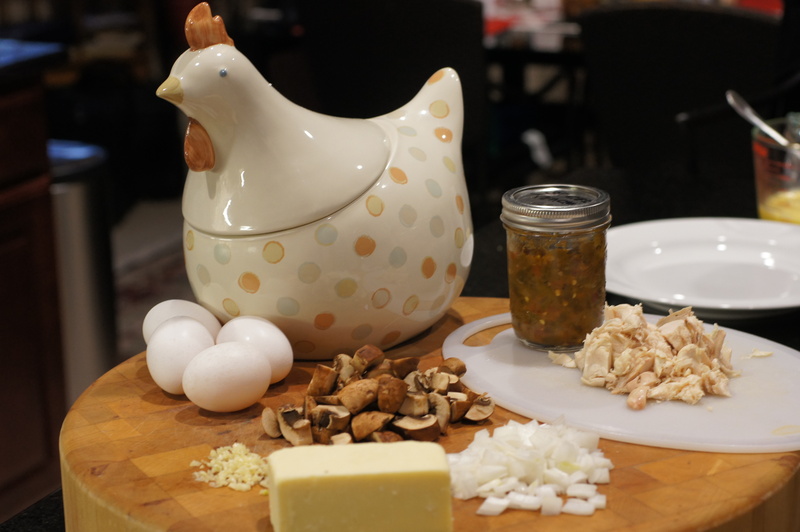 We simply had chicken and mushrooms we needed to use and an excuse to show off Hetty the Hen. LOL! 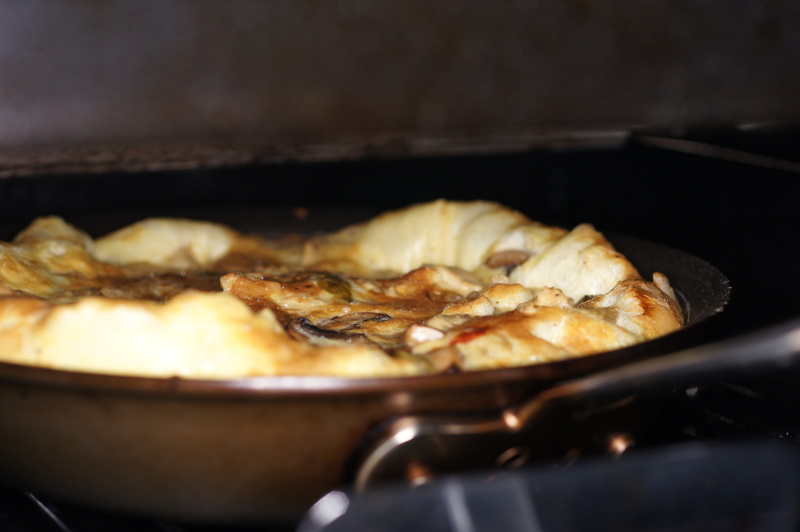 Great frittata, but ‘the Irish ogre’ steals the show here. Absolutely ***ing brilliant! Thanks, Stefan. 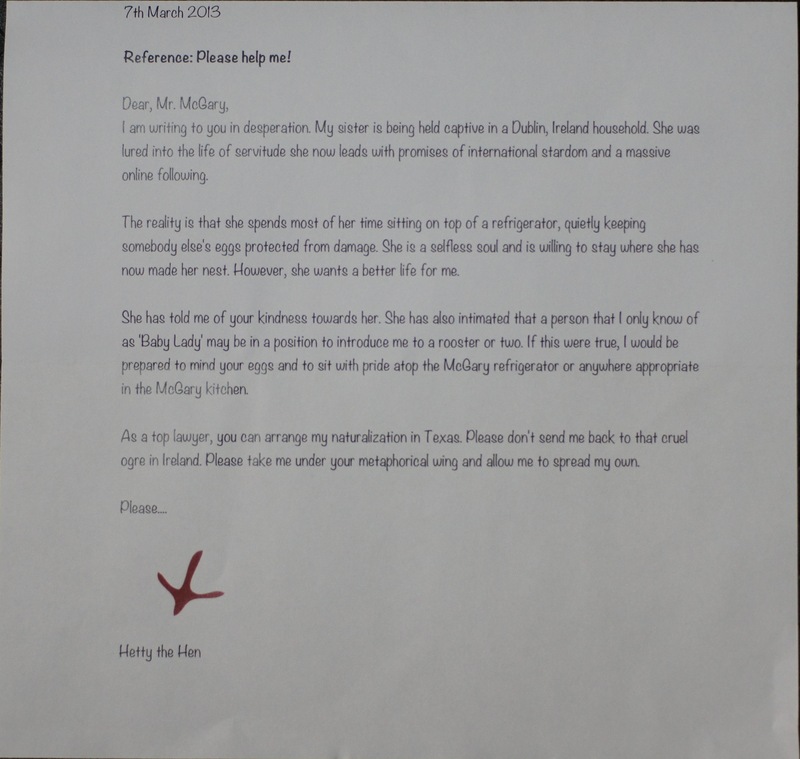 I was really dumbfounded when I received Hetty at my office and the letter was hilarious. Baby Lady and I both rolled laughing. I just had to share. I don’t know which of the two of you have the best sense of humor…I’m still laughing at the clever letter and post. 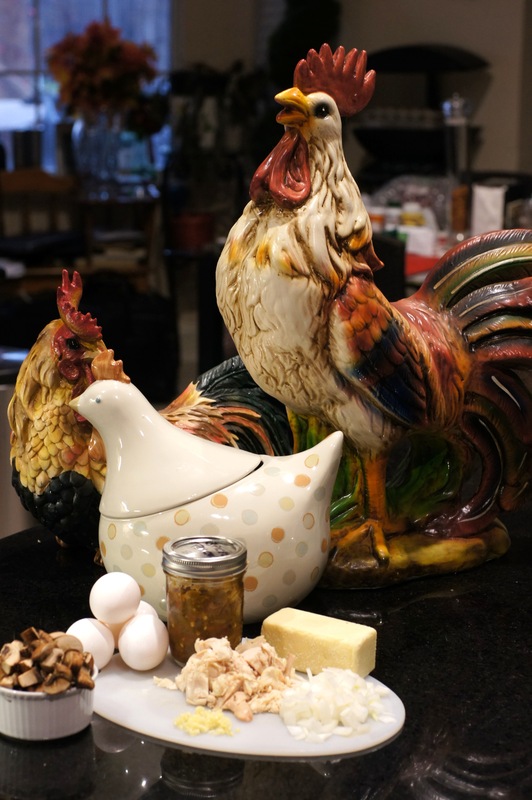 After seeing the delicious looking frittata made with eggs that Hetty is guarding so diligently, I will be more than happy to write a letter vouching that she would be a welcomed hen citizen in the wonderful state of Texas. Thanks, Alice. We’re glad you liked it. Hetty is no trouble at all as she is so glad to be away from that Irish ogre. Wow Richard go on with your bad self your cooking abilities are awesome .You should be teaching at some culinary arts school .You are great and wonderful cook-I mean chef.You need to open up a restaurant and get those Michelin stars. Thanks, Nicole, for the very kind words but no restaurant for me. I have too much fun cooking with and for the Baby Lady to want to do this for a living. That’s cool I understand your cooking for your lady.I bet she loves a man that can cook something other than spaghetti-O’s. 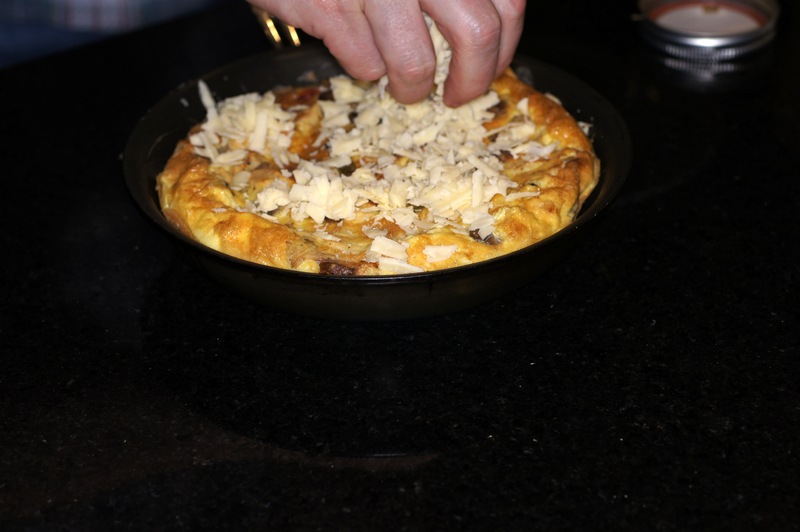 I just left a buddy’s post in which he made a frittata with a definite Spanish flair. I myself made one quite recently and will be posting it sometime in the future. Must be something in the air. No matter. 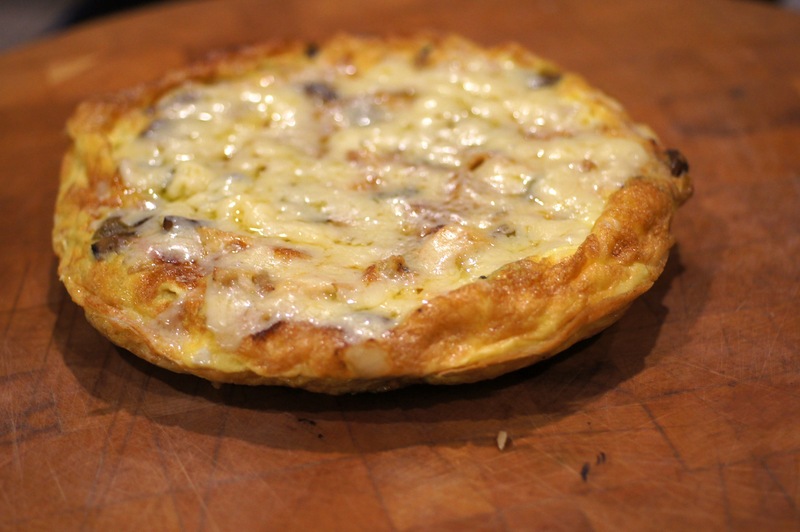 Your frittata, like his, looks delicious and combines a great list of ingredients. And Hetty the Hen certainly landed in the right office that fateful day. I’d no idea that ceramics were such fine judges of character. Thanks, John. Glad you liked it. I’m anxious to see your frittata. OK, now you’re talkin’. This one’s right up my alley, Richard. I’ll be trying this one out soon! Very funny! Clever, cute! 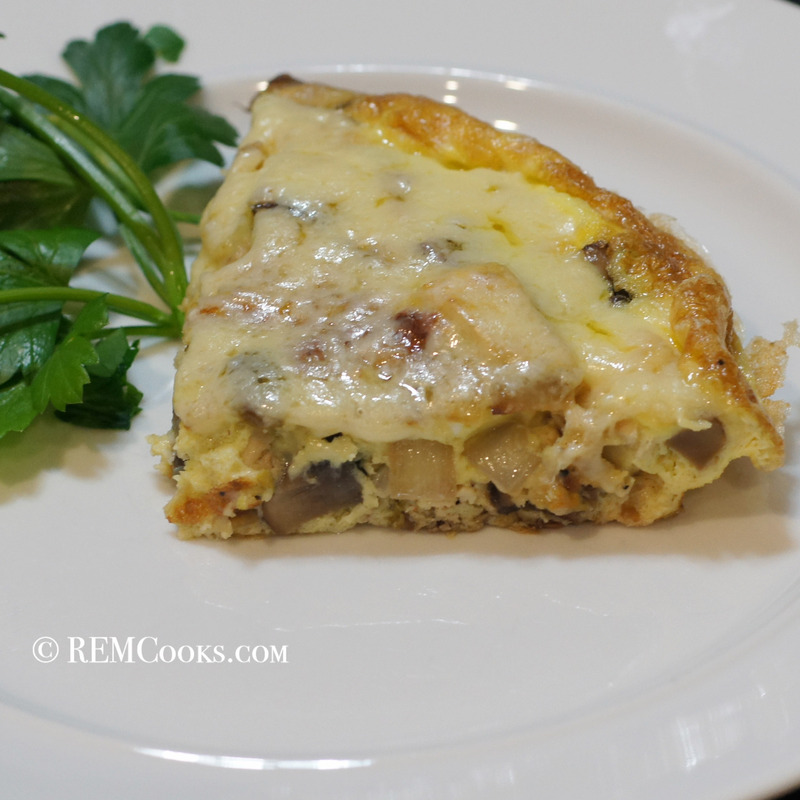 And that is one delicious looking frittata (a thing I’m so very fond of!) Very nice job, Hetty! A shame about the work visa! 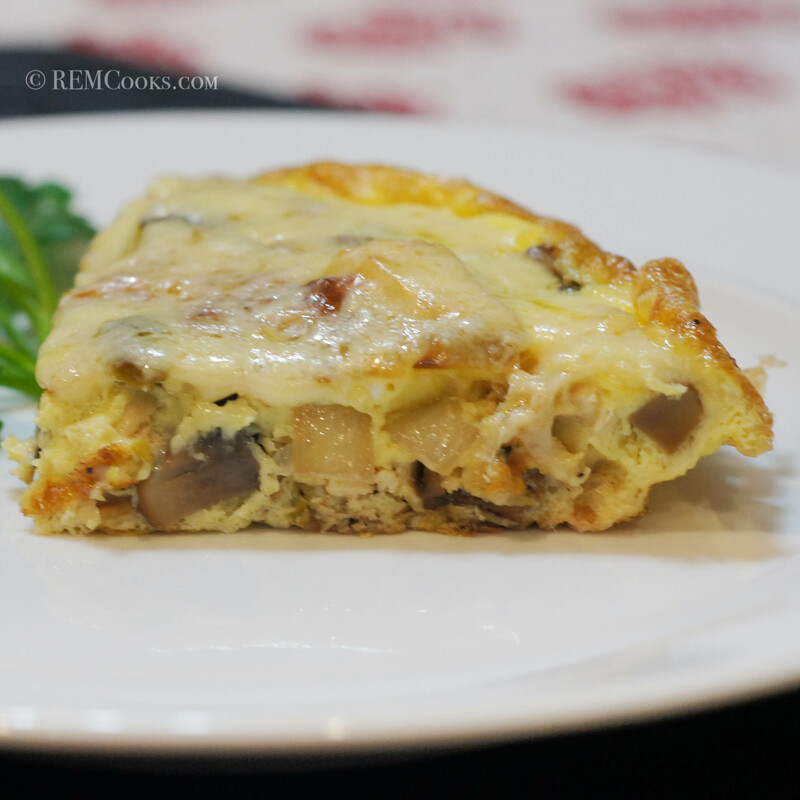 As I continue my quest of cooking through your blog… My girlfriends LOVED this tender, moist and delicious frittata! I had so much fun increasing the volume to serve eight hungry ladies this morning!!! It came right out of the pan and looked beautiful on the serving platter. Thank You for the absolutely adorable story… you really could write a book! 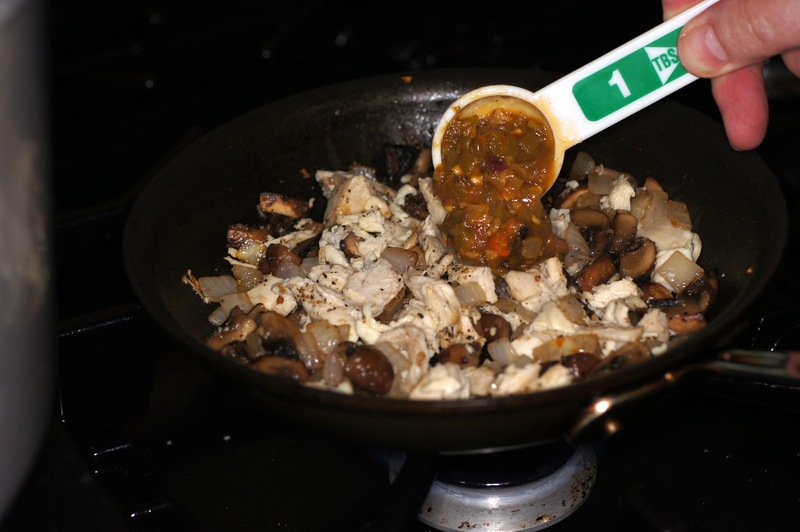 Or, two… one on cooking with chiles and peppers and one for everything else! Go for it! Hi Richard, just read this now. All I can say is ‘Touché’. Brilliantly written. Thanks for a great laugh. Great to see Hetty is safe and enjoying the company. nicely done – both of you. Wow! And I was only searching for a frittata recipe. So, now, a question. Do the eggs keep better in Hetty than in the frig? Thanks for dropping by and your comment. Hope to see you around more often. There are various studies on storing eggs, refrigerated vs. room temperature. Unless you are buying local, farm fresh eggs, your best bet is to store the eggs in the refrigerator because, under FDA regs, eggs can be 30 days old and still be labeled fresh. This is hysterical! How did I miss this post?!!! Thanks, Mimi. This was a fun post. Conor cracks me up and Hetty’s arrival was too funny. Baby Lady & I laughed and laughed. We just had to share the story. As for missing it, it is so hard to read and keep up with all the blogs we follow. Every so often, one gets skipped inadvertently.